Choose from our wide selection of Pai Gow Supplies. We carry 5/8" Pai Gow Dice, Aluminum and Gold Finish Pai Gow Cups, Felt and Billiard Cloth Layouts, Three Different Tile Sets, and Action, Dealer, and Banker Buttons. Our Pai Gow Dealer Buttons, Action Buttons, and Banker Buttons feature a high-gloss pearl white finish. Each button is imprinted with a metallic red English word and Chinese Character. Pai Gow buttons measure 1-7/8" wide by 1-1/4" long. These Pai Gow Cups come with matching lids. Our Aluminum Pai Gow Cup features a high gloss silver finish and measures 2-1/2" inches tall and 3-1/8" across the top (with lid). The Anodized Pai Gow Cup features a matt Gold Finish and measures 2-1/2" tall and approximately 3-1/4" across the top (with lid). "Brass" Sale Price: $39.46. Was $49.50. Save 20%!. These Pai Gow Dice are available in a set of three. The dice measure 5/8" and are translucent red. Printed on casino quality Mali, our Billiard Cloth Pai Gow Layout is top-of-the-line. The layout measures 60" in length and features an overall casino green color. Now $83.28 Each. Was $119.50. Save 30%! Our Home Style Pai Gow Layout is made of high quality 2-millimeter thick green felt. Each layout measures 3 feet wide by 6 feet long. Economical and durable, this Pai Gow layout is ideal for home or small group use. Sale Price: $11.91. Was $19.50. Save 39%. This antique-style wooden box features a traditional design and authentic look for the storage and presentation of this Pai Gow Set. These sets include tiles with red and white pips and a high-gloss black pearl finish, three small white dice and a Pai Gow Dealer Button. 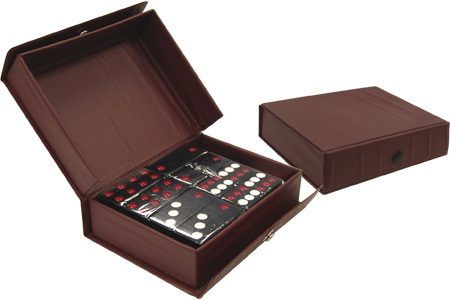 Our Brown Vinyl Case features a carry handle and snap-shut top for easy transportation of your Pai Gow Tiles. This Home-Style Pai Gow Set features tiles that have a high-gloss black pearl finish with white and red dots. Three small white dice and a Pai Gow Dealer Button are also included. Please feel free to continue browsing online, or contact us at 1-800-233-0828 for a FREE 96 Page Casino / Game Room Supplies Catalog.